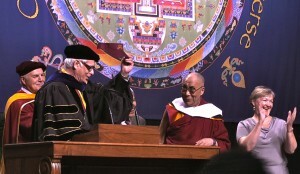 His Holiness receives an honorary Doctor of Humane Letters degree conferred by University of Minnesota President Robert H. Bruininks, May 2011. Image by Ven. Lhundub Daychen. The University of Minnesota’s Center for Spirituality and Healing and the Tibetan American Foundation of Minnesota presented four days of special events May 6-9 in Minneapolis, Minnesota, USA, centered on the visit of His Holiness the Dalai Lama. His Holiness conferred a Medicine Buddha empowerment promoting personal and societal healing, and a public address on the theme of “Peace Through Inner Peace.” He also met with the local Tibetan community, engaged in a panel discussion on the state of Buddhism with American and Chinese scholars and students, and spoke with the media. He received an honorary Doctor of Humane Letters degree conferred by University of Minnesota President Robert H. Bruininks. The event also hosted the Second International Tibetan Medicine Conference and launched the Tibetan Healing Initiative. There were dance and theatrical performances by TIPA, TigerLion Arts, and local Tibetan children. His Holiness the Dalai confers a Medicine Buddha empowerment promoting personal and societal healing in Minneapolis, Minnesota, USA, May 2011. Image by Ven. Lhundub Daychen. In the preparatory talk for the empowerment, His Holiness spoke about the commonalities among world religions in developing beneficial inner qualities such as compassion, forgiveness, tolerance and contentment. These positive qualities contribute to a happier and meaningful life for everyone, and on this basis we can work and live together with mutual respect, leading to genuine affection. He compared the different approaches of theistic and non-theistic religions for developing unbiased love and compassion, emphasizing that all religions share this purpose. His Holiness said the Buddha’s teaching on the four noble truths presents causality in terms of suffering because that is our main concern. Dependent origination is the essence of Buddhism and is comprised of both a philosophy and conduct – the truths of suffering, origin, cessation and path present the nature of reality, and we engage by actualizing cessation through cultivating the path. By meditating on the four characteristics of impermanence, dissatisfaction, no-self and emptiness to deepen our understanding, one recognizes that suffering can be eliminated and cessation can be attained, and so a genuine aspiration to liberation arises. In this context, His Holiness continued, the Buddha taught the three higher trainings of ethics, meditation and wisdom. One then cultivates an altruistic motivation and bodhichitta comprised of the two aspirations – the wish to benefit others and to attain enlightenment oneself – and engages in the practices of the six perfections, the heart of the path. It is within the last two perfections of concentration and wisdom that Vajrayana excels, due to the multitude of techniques and methods available. His Holiness described refuge in the context of the seven vajra points of Maitreya’s Uttaratantra, and explained that suffering caused by adventitious negative emotions rooted in distorted ignorance can be eliminated by the directly opposing realization of ultimate reality. Advising participants to visualize according to their own religious views, he then led the recitation of the three verses of the altruism pledge ceremony. His Holiness talked about the meaning of “blessing” as transformation of the mental continuum through brilliance and majesty. Due to interdependence, things are not absolute and change according to other factors. In the Christian context, blessings come from God. In the Buddhist context, blessings come from the four kayas. Blessings depends on the law of causality, and not wishful thinking; it helps to clear some “inner space,” but action is also required. Blessings alone cannot cure illness; medicine is also necessary. The Seven Medicine Buddhas aspired to help the sentient beings of this time. Our main practice is altruism. He then conferred the empowerment. The public address was another inspiring example of His Holiness’ ability to reach a diverse audience of 6,000 with his focus on our common humanity, and an inclusive secular approach to ethics that avoids potentially divisive religious dogma and calls for equal respect to all religious and non-religious people. The medical conference hosted doctors from the Men ste khang who conferred with about 300 Western practitioners from various health fields, including veterinary, on the benefit of increasing greater awareness of the methods available through Tibetan medicine, the need for more translation of the Tibetan medical literature and more study of the efficacy, and the importance of love and compassion in healing. 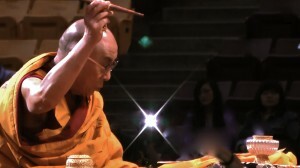 You can find more information about His Holiness’ travels during April and May 2011. Ven. Daychen has been a student at Deer Park in Wisconsin since 1986, where she was ordained by Geshe Lhundub Sopa Rinpoche in 1998. Her current interest is translating Dharma to contemporary video and other media formats.